Chris Kyle's memoir is about pursuing your calling. A good biography is one that inspires and motivates readers because of the passion of the subject whether they be a politician, entrepreneur, athlete or artist. This book chronicling the journey to becoming a Navy SEAL is no exception. Chris Kyle had a goal and he pursued it with all he had. Upon becoming a SEAL he realized that the rewards were much greater than he ever imagined. In an interview with The New York Times in March, Kyle - who received two Silver Stars and five Bronze medals for valor - said he hesitated to write about his experiences. He was persuaded to move forward after hearing that other books about members of the SEALs were in the works. "I wanted to tell my story as a SEAL," he said. "This is about all the hardships that everybody has to go through to get the respect and the honor." Chris loved his country, God and family - not necessarily in that order. During his four tours he terrorized the Iraqi insurgents, which resulted in a bounty on his head. Ultimately, he decided to come home to his family. Stateside, he found ways to continue serving his country including helping wounded warriors suffering from PTSD. American Sniper is not about being a hero but defending your family. "A green hunting cap squeezed the top of the fleshy balloon of a head. The green ear-flaps, full of large ears and uncut hair and the fine bristles that grew in the ears themselves, stuck out on either side like turn signals indicating two directions at once. Full, pursed lips protruded beneath the bush black mustache and at their corners, sank into little folds filled with disapproval and potato chip crumbs. In the shadow under the green visor of the cap, Ignatius J. Reilly's supercilious blue and yellow eyes looked down upon the other people waiting under the clock at D.H. Holmes department store, studying the crowd of people for signs of bad taste and dress." So begins this Pulitzer Prize winning novel, with a hero literally larger than life. Set in New Orleans, the story revolves around Reilly's dictate of the real world and his lack of success in it. "I dust a bit," Ignatius told the policeman. "In addition, I am at the moment writing a lengthy indictment against our century. When my brain begins to reel from my literary labors, I make an occasional cheese dip." Reilly is the uncrowned ring leader of a zany cast of characters, who weave in and out of the French Quarter (a timeless description of this destination for sure). The dialogue is rapid fire and hilarious--you will chuckle out loud. The group is a carnival of personalities bizarre enough to ring true. The book not only captures the essence that is the city of New Orleans but the human comedy and tragedy of everyday life. A Confederacy of Dunces was published posthumously following John Kennedy's Toole suicide in 1969. He was 32 years old. A friend shared that she was reluctant to read this book because it may be "one of those." It is. It chronicles a parents nightmare of normalcy one day and realizing you know nothing about your child's life, despite sneaking peaks at Facebook occasionally, the next. Worse yet, the parents feel helpless. Defending Jacob is a who done it about murder of a teenage boy in an affluent suburban town. And like any good legal thriller, once you start reading it, you can't put down. Dun Dun (cue “Law and Order" sound effects). Andy Barber has been an assistant district attorney in his suburban Massachusetts county for more than twenty years. He is respected in his community, tenacious in the courtroom, and happy at home with his wife, Laurie, and son, Jacob. Then, all at once everything changes. Andy’s fourteen-year-old son is charged with the murder of a fellow student. Every parental instinct Andy has rallies to protect his boy. Jacob insists that he is innocent, and Andy believes him. Andy must, but why? Is it because he’s the boys father or is it that his son is sanity and salvation. "Completely objective and unbiased, no. But I think for every parent there are moments when you see your child at a little distance, with a little objectivity. When the kid misbehaves or shows bad judgment, or just surprises you by doing something unexpected. Every parent has moments where you think, 'This kid really is his own person — another human being, not just an extension of myself.' Those moments feel a little sad, actually. You feel a little sense of separation, a precursor of the big separation that all parents have to steel themselves for, when the child finally leaves the family to go off into the world as a young adult. But completely unbiased? No way. We’re all like Andy Barber, deep down. We see with our hearts." A former district attorney who holds degrees from Yale and Boston College Law School, William Landay is the author of The Strangler and Mission Flats. Visit him online at www.WilliamLanday.com. There are things we were raised not to talk about in polite company. 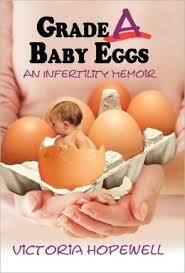 Infertility is one of these topics. Victoria Hopewell’s personal memoir, Grade A Baby Eggs, shares her IVF journey and gives permission to ask, laugh and learn. Winner of the ForeWord Reviews Book of the Year Awards and The National Indie Excellence Awards in the category of women's issues and the USA Best Book Awards in the category of women's health, Grade A Baby Eggs takes readers through the ordeal chronologically with chapter titles that humorously depict the stages of a harrowing experience. "Now I had two “prom queens” on hold who could become the egg mother of my child... Plus this donor had a big selling point. She had spent time in Disneyland playing Cinderella. I figured if she was good enough for Walt Disney standards, then she was good enough for me!" Her Carrie Bradshawesque honesty illuminates the stark reality of infertility and the many unappealing procedures required to verify it, as well as unglamorous other means to become pregnant, if the woman so chooses. Parallel to the medical aspects is Hopewell’s personal experience: the upsetting conversations with her children about the specifics of adding a new family member and the difficulties she faced in making the decision to use a donor egg. The emotional implications of any pregnancy can be far-reaching—the ostensibly joyous occasion can be colored by any number of complications, as Hopewell frankly describes. Hopewell’s memoir sheds a sometimes unflattering light on her life en route to an unconventional pregnancy; her bluntness is to be commended because it may be just what some women in similar circumstances - and those who care about them - need.